I’m an atheist, but I’m sort of drawn to religion, even though I fight it. I’m not sure why as I’m not necessarily looking for answers. I suppose what I’m after is to obtain a peace with myself. Some of my earliest searching led me to read about Buddhism. I knew I didn’t want anything to do with ‘god botherers’ and Buddhism seemed to offer a religion that sort of made sense. I say sort of because I have one really big problem with Buddhism and that’s reincarnation. I don’t believe in it. For me gods, reincarnation and time don’t exist; only the here and now. As I’ve mentioned before on this blog I used to attend Quaker meeting for worship. I did so for five years which was pretty good for me but for a number of reasons I couldn’t sustain it and never felt able to apply for membership. I think this is the problem I don’t really want to join a religious organisation but I want to partake in some of their practices and thinking. Perhaps there’s an online community that I could dip into? I’m a shy sort of bloke really. I am nervous of many social situations. One thing that has always foxed/scared me is social kissing and hugging; when to and when not to. As a result I tend not to push myself forward for such things, preferring to wait for the other person to make the move. Perhaps I’m repressed? Who can say? It has occurred to me that these social norms are an ever changing beast. Even earlier in my lifetime such familiarity would have been seen as quite outrageous. In Victorian times such behaviour would have been seen as licentious and probable an arrestable offence, as it would today in many conservative cultures. In this country that which is socially acceptable between friends is ever changing. Who knows where we will be and what will be acceptable in five, ten or twenty year’s time? Last Friday I met my pen-pal for the first time. Does that mean she is no longer my pen-pal? I think it may well do. We had an away day to a popular city. Chosen because it was only two hours by train for both of us. And, thankfully, the trains behaved themselves. In terms of scheduling ‘our day’ ran like clockwork. The day wasn’t about being tourists, it was a convenient place to meet and to start to get to know each other. A way to animate our erstwhile predominantly written based friendship. My pen-pal had “the whole Red Polka Dot meets Purple vibe” going on which made for easy spotting as I met her off her train. Right from the beginning we started chatting with ease. Beforehand I think both of us were a tad concerned that we might run out of things to say. Not one bit. We chatted more or less constantly yet we only seemed to scratch the surface of us. We drank coffee, we lunched. I didn’t get as many chips as I should have done and there was a hint of garlic in the air. 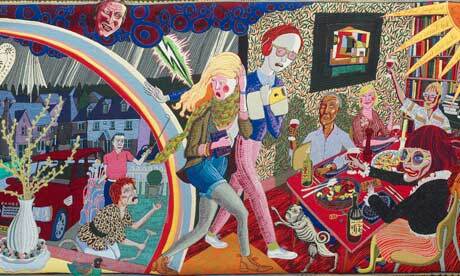 After lunch we toddled off to see the Grayson Perry exhibition at the Victoria Miro. Not an easy place to find. But it was well worth finding. I’m a big fan of Grayson. I love his work. I like the way he weaves so much into his pictures; words and colourful images merge. Each time you look at his work you see something new. Check it out. Our day went so quickly and before we knew it we were sitting in the Bree Louise, a real ale pub close to Euston station having a last drink before my pen-pal caught her train home. I think we have established a friendship that will last. I hope we have. When, where and whether we’ll meet again remains to be seen but I hope we do. Just before we came back from France on the shuttle just over a week ago we dived into Carrefour in Cite Europe to do a mega shop. You know the sort of thing; essentials; beer, wine, cheese, saucisson, crisps and sweetie things. 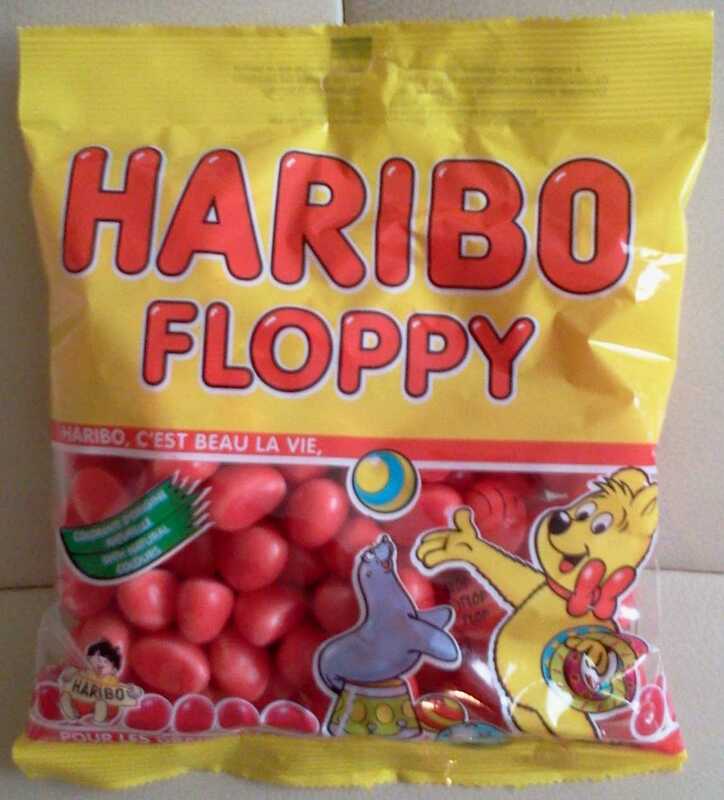 One of the packs of sweets I brought was made by Haribo and residing under the name of ‘Floppy’. 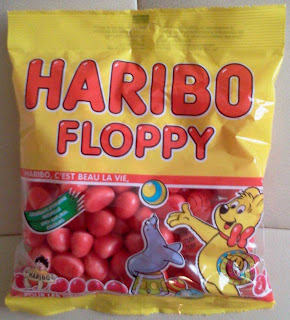 For all I know the Haribo Floppy may well be a big hit in British playgrounds but I’d never heard of them. So I just had to buy them. Haven’t tried them yet. I might just keep them in their virgin state. I happen to think all life is sacred. And, even though it is a word that has its origins in the religious I don’t mean sacred in a religious way. I just believe life to be the most important thing. In fact really it is the only thing! Unfortunately as far as the gospel according to the British news media is concerned there are British lives and then there are the lives of Johnny foreigner; the former taking president over the latter. It never fails to irritate me how our media reports the loss of life in wars and other disasters. X amount of Britons dying will be conveyed in suitably sombre and sympathetic tones. Any death of those from other nationalities will be delivered almost off the cuff and in a very matter of fact way. I’ve no doubt that the same happens in other countries. Art/Empire/Industry we all need that spectrum. 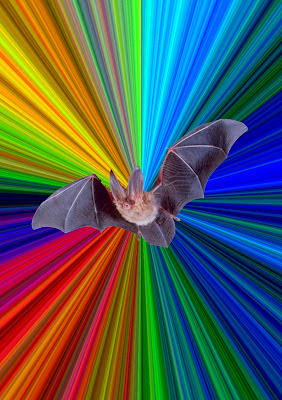 We all need those colours. I likes a good rainbow. It often makes me feel that I’d like to dip my brush in one and paint the world.